MMS MAY 2018 74 mmsonline.com MACHINE MAINTENANCE Like Uber for Machine Tool Service? The Up! app aims to let shops facing urgent service requests find capable and proven independent service providers quickly. A. Vinod, CEO of Up LLC, the company develop- ing the new "Up!" app for machine tool main- tenance, says his company's research shows that 1.5 percent of machine tools are out of use due to some form of unplanned downtime at any given moment. The unplanned downtime frequently prompts the need for unplanned maintenance attention, and shops tend to rely on their machine suppliers for this maintenance. However, this share approaching 1.5 percent is a large portion for these suppliers to try to ser vice promptly. During an economic period such as this when manufacturing is busy, shops know the result of this demand: There is queuing of ser vice requests, with some shops left waiting for ser vice appointments. Independent machine tool service provid- ers could be an answer. The problem is finding and evaluating these providers on short notice. The Up! 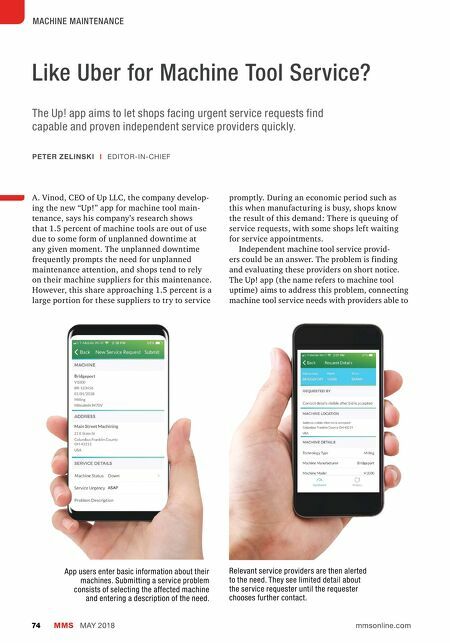 app (the name refers to machine tool uptime) aims to address this problem, connecting machine tool service needs with providers able to PETER ZELINSKI | EDITOR-IN-CHIEF App users enter basic information about their machines. Submitting a service problem consists of selecting the affected machine and entering a description of the need. Relevant service providers are then alerted to the need. They see limited detail about the service requester until the requester chooses further contact.